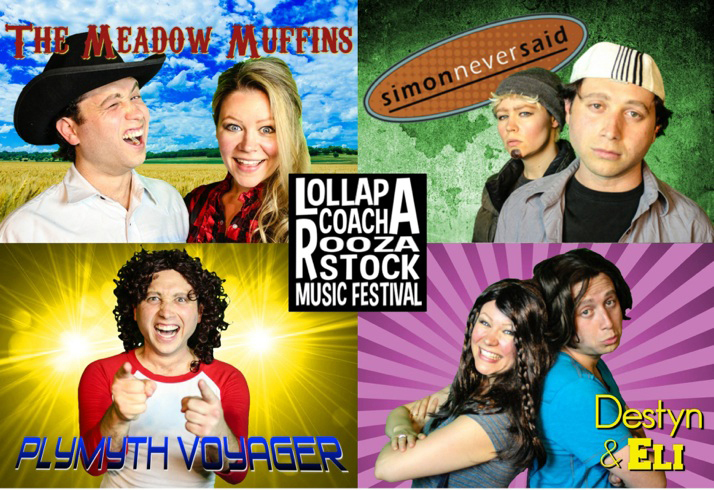 The Lollapacoacharoozastock Music Festival descends upon the NY Fringe Festival via the Groundlings comedy troupe from LA! The lineup features killer music from the likes of Disney Channel stars Eli Porter and Destyn Reign, country music crooners The Meadow Muffins, 90’s alt-rockers Simon Never Said, and power ballads from the legendary rockers of Plymouth Voyager. Here’s the thing – they are all the same people. Adam Blotner, who wrote the music and lyrics for all the songs, and his wife, Jenny Pinzari Blotner, embody every one of the fictitious musicians headlining this faux festival, in an all too brief jam session that hilariously lampoons a couple of decade’s worth of music. All that’s missing are the gooballs. As directed by Phyllis Katz and backed by the band the Positive Feedback Band, Mr. and Mrs. Blotner bring a lot of swagger and energy to the music and madcap character interactions between songs. To facilitate the frequent costume changes, Mr. Blotner and Ms. Katz offer up little snippets of video to introduce each band and communicate the spaced-out vibe of the festival. In one video Mr. Blotner’s Justin Bieber/Zac Ephron analogue – the bow-tied Disney Channel star Eli Porter – fields dumb questions from his overenthusiastic fans; in another the patriotic country music group known as the Meadow Muffins outline the humdrum things that define America to them. “Apple pie,” Mr. Blotner says. “An old lady, just sitting in a car,” Mrs. Blotner adds, heartfelt. I know “real artists” sometimes look down their noses at parody, but Mr. Blotner’s ability to parrot so many different styles of music in such a concentrated setting truly is impressive. Down to the smallest details, like the two-syllabled “yeah” in the chorus of Simon Never Said’s “Alone,” Mr. Blotner’s catalog amusingly zeroes in on things unique to each time period or type of music. You can see for yourselfat http://www.positivefeedbackrocks.com, where some of the music can be streamed. One of the best gags comes in the Plymouth Voyager song “Road Trip to Space,” which simply refuses to end. Mr. Blotner, playing the band’s regal front man in long-hair and mom jeans, even had time to pop over to the bar for a beer between refrains. As musical and comedic performers, both he and Mrs. Blotner are top notch — they are especially funny in the finale, which is a kind of fair use ripoff of Journey’s “Don’t Stop Believin'”. Like everything else in Lollapacoacharoozastock, it rocks. *I’ll also admit to developing an instant sentimental attachment to this show upon reading the program notes. Mr. and Mrs. Blotner apparently got married at the beginning of this month and then immediately did a show in the Fringe, which is exactly the way my wife and I did it five years ago. Presented by Positive Feedback as part of the New York International Fringe Festival at Subculture.